The dottyback changes its colour to match surrounding damselfish species, enabling it to counter the defences of its damselfish prey by disguising itself as a harmless part of their community, then swoop in to hunt their young. A new study has shown that the dottyback, a small predatory reef fish, can change the colour of its body to imitate a variety of other reef fish species, allowing the dottyback to sneak up undetected and eat their young. The dottyback also uses its colour-changing abilities to hide from larger predators by colour-matching to the background of its habitat - disappearing into the scenery. The research, published today in the journal Current Biology, reveals a sophisticated new example of 'mimicry': disguising as a different species to gain evolutionary advantage. While using mimicry to hunt or hide from other species is commonplace in nature - from cuckoos to butterflies - scientists point out that if the same physical deception is encountered too frequently, species on the receiving end become more vigilant and develop tactics to mitigate the mimics. Scientists say that this flexibility of physical mimicry makes it much harder for the dottyback's prey to develop detection strategies and avoid getting eaten. "By changing colour to imitate local damselfish communities, dottybacks are able to overcome the predator avoidance behaviour in the juvenile fish they hunt," said Dr William Feeney, co-author of the study from the University of Cambridge's Department of Zoology. "The dottyback behaviour is comparable to the 'wolf in sheep's clothing' scenario from Aesop's Fables, where distinguishing the predator from the harmless 'flock' becomes increasingly difficult when they look alike - allowing the dottyback to creep up on unsuspecting juvenile damselfish," Feeney said. While dottybacks can vary their colouration from pink to grey, the researchers focused on two colour 'morphs' - yellow and brown - that both occur on the reefs surrounding Lizard Island, off the coast of north-east Australia. This is because the area has populations of both yellow and brown damselfish, and habitat consisting of live coral and dead coral 'rubble'. The scientists built their own simulated reef outcrops comprising both live coral and rubble, and stocked them with either yellow or brown damselfish. 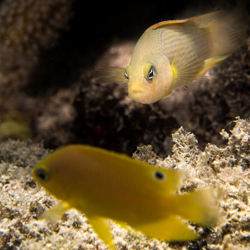 When released into reefs with damselfish of the opposite colour, scientists found the dottybacks would change from yellow to brown or vice versa over the course of approximately two weeks. Anatomical study of dottyback skin cells revealed that while the level of 'chromatophores' - pigment-containing cells that reflect light - remain constant, the ratio of yellow pigment cells to black pigment cells shifts to move the dottyback from yellow to brown or back again. The scientists also found that the dottyback use their colour-morphing powers to blend into the coral of their habitats to hide from their own predators, such as the coral trout - a predator they share with damselfish, who have also adapted to match the colour of their environment. The scientists measured the strike rates of coral trout when exposed to images of different colours of dottyback against different habitats. The coral trout had trouble picking out the fish when the colour matched the habitat. "While the dottybacks change colour to aggressively mimic damselfish, they may also gain a secondary benefit: a reduced risk of being eaten themselves. Damselfish have evolved to blend into their environment, so, by imitating the damselfish, they also colour-match the habitat - making it harder for coral trout to see them," said Feeney. "This is the first time that an animal has been found to be able to morph between different guises in order to deceive different species, making the dottyback a pretty crafty little fish"